INDES-IDS BV is the exclusive partner of IAR Systems in the Benelux, offering the full product range as well as being responsible for the 1st line support to IAR customers. IAR Systems has been a key partner of our company since the start, some INDES-IDS employees have actually been working with IAR since as early as 1986 (!). In the '80's IAR systems was a pioneer in Compiler development being the first company to offer a full ANSI-C cross compiler for microcontrollers. Based in Sweden. IAR Systems provides a range of development tools for embedded systems: integrated development environments (IDE) with C/C++ compilers and debuggers, development kits, hardware debug probes and state machine design tools. The product line supports 8051, ARM, AVR, MSP430 and many other 8-, 16-, and 32-bit MCUs from different chip manufacturers. 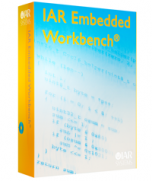 Embedded Workbench — a development environment that includes a C/C++ compiler and debugger that supports 30 different processor families. IAR VisualSTATE — a design tool for developing event-driven systems based on the state machine paradigm. IAR VisualSTATE presents the developer with the state machine subset of UML which enables efficient C/C++ code generation. By restricting the design capabilities to state machines it is possible to employ formal model checking to find and flag unwanted properties like state dead-ends and unreachable parts of the design. It is 'not' a full UML editor. IAR KickStart Kits — a series of software and hardware evaluation environments based on various popular microcontrollers. IAR Systems is the world's leading provider of software tools for embedded systems that enable large and small companies to develop premium products based on 8-, 16-, and 32-bit microcontrollers, mainly in the areas of industrial automation, medical devices, consumer electronics and automotive products. IAR Systems has an extensive network of partners and cooperates with the world’s leading semiconductor vendors. Established in 1983, IAR Systems is a part of Intoi, formerly Nocom, since 2005. The company is headquartered in Uppsala, Sweden and has direct offices in Germany, France, UK, USA, Japan, China and Brazil. Please contact Glenn Moloney at (+31) - (0)345 545 535 for IAR pricing. Orders can be placed by E-mail ( ), fax or regular mail. Please mention a Purchase Order Number as reference and shipping / billing addres. Purchase orders from Belgium and Luxembourg should also include the VAT/ BTW / VTA number, so we can invoice you without the VAT. Delivery time is maximum one week, usually only 2-3 working days.